You do watch some film with positive approach When you are aware about the fact that movie is Inspired by a True story. Mein pan kaik aevu j karyu Manjhi film joti vakhte. Dasharath Manjhi ni True story tarike Aa film juvo to standing obviation aapvanu mann thaay aa manas ne, pan to be very honest interval sudhi ma tamne aem thashe ke ghanu slow chhe movie and by end of the film tame kaik aavu j bolta hasho ke ‘’Be Ghajjab kehvaay nai… pan Nawazuddin Siddiqui naa hot to sahan j naa thai hot’’!! Movie by movie Siddiqui proves ke ae khatarnaak actor chhe and his performance as Dasharath Manjhi is simply outstanding, brilliant superb, mind blowing. Ketan Mehta aa film ne (may b) ghani saari banaavi shakya hot pan ae maro Vishay nathi. Over all interval pachhi movie thodi jaame chhe ane sehanable bane chhe. Ek true story ni rite film josho to j gamshe baaki ghana badha minus point chhe film maa je tamne disappoint kari shake chhe. Fav scene: Dukaal no scene majboot chhe. somehow disappointed by this type of review for this type of movie. Does he succeed in taking his wife’s death’s revenge from the mountains, does he have a change of heart, and does the government or anyone else help in his ‘uphill task’ endeavour is what forms the rest of the film. 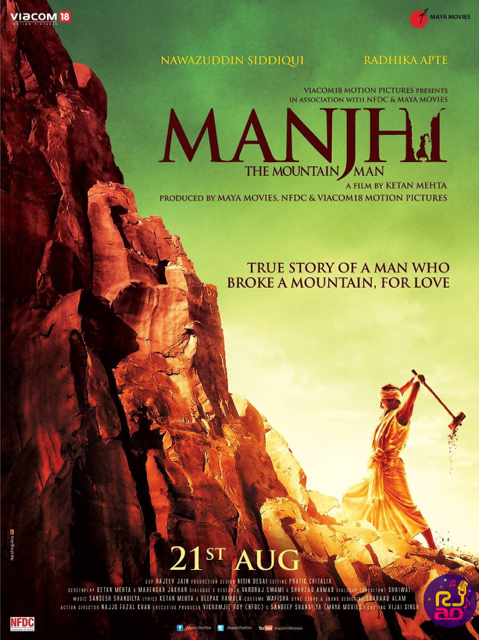 Rest of the star cast do justice to their roleManjhi The Mountain Man has cult status written all over it. It is definitely worth watching thanks to the stupendous performances by Nawazuddin Siddiqui, superb direction and astounding background score. Was this review helpful to you?